After a seemingly never-ending winter in Chicago and two great hot and sunny months in central and south-eastern Europe I’m back for a second year of cooking and food shopping in Chi-town, among other things. Hopefully the new season will be better than the first, though unfortunately the props are still the same – an almost non-existent kitchen in the hallway and even less counter space. But I smuggled deep round baking trays for holiday pita and banitsa (Bulgarian stuffed filo dough pie) and some Balkan sage and thyme, so there are improvements in the kitchen after all. I spent half of July and all of August on the Bulgarian sea coast, starting the day with thick slices of tomatoes on buttered toast, continuing with tomatoes and feta salad for lunch, and ending it with more tomatoes and roasted long peppers or eggplants in tomato sauce, or stuffed zucchini with tomatoes, or nibbling cherry tomatoes straight from the vine, or… you get the picture. The sun ripened tomatoes from my aunt’s garden are the second reason I go back to Bulgaria every summer – the first being my family and friends. The fact that my parents live ten minutes from the sandy beaches of Varna – the best city in the country – is also a big plus. I’ve never found better tasting tomatoes – heavy, meaty, sweet. Bulgarians are crazy about their tomatoes, and most of them will grow their own in every available plot. August will be dominated by tomato topics such as the prices on the market, a disease threatening the crop or the extinct local varieties. The pungent sweet fruits will even overshadow yet another cabinet crisis or new corruption scandal and everybody’s weekends will be spent not on the golden beaches, but plucking or watering the mighty tomatoes. Growing, eating and canning tomatoes is our national sport. And though I’ve been living abroad for many years now, I’m more than happy to participate in those late summer games. By September I have tomato juice flowing in my veins instead of blood, and my kids do too – after all, they are half Bulgarian. Back in Chicago, I got to enjoy the latest crop from my mother-in-law’s back yard. That started my quest on farmers’ markets. I found reasonable tomatoes – not as sweet and aromatic as my aunt’s, but the best so far on this side of the pond – at Lincoln Square’s Tuesday market (on the parking lot by the Western Brown Line El stop). The price, $1 per pound, was also reasonable, and I went home with several varieties – Roma, regular red ones and very tasty yellow globes. At home I made a colorful salad, adding pear-shaped yellow cherry tomatoes from my mother-in-law’s yard (they grow like crazy till late October). Though basic, it’s a beauty, and could lift your spirits for the whole day. On the market I also got sweet long peppers, so I had to use them too. 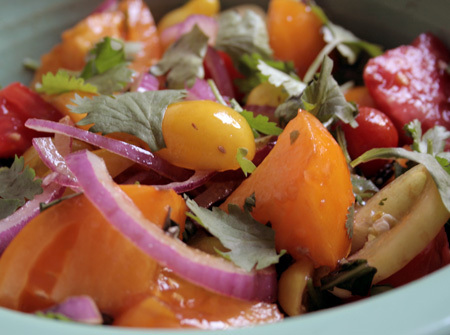 This salad really depends on the flavor of the tomatoes, so make sure to use really good ones. Never ever keep tomatoes in the fridge. They have to be eaten at room temperature or you are going to miss a lot of their aroma and sweetness. Choose specimens that are heavy for their size and rather hard, and please do use your nose – they should smell of sun and grass not fish and cardboard. I usually don’t peel them and don’t deseed. Slice the tomatoes as you like – I like country-style chunks, bite size. Slice the pepper into rings. Place all the vegetables in a salad bowl, sprinkle with salt, a little vinegar and a nice splash of olive oil. 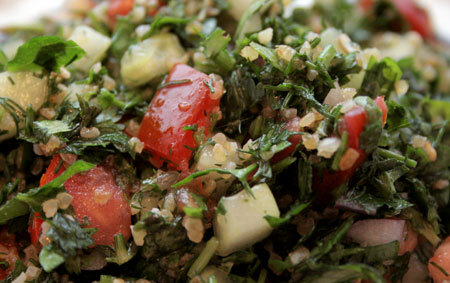 Mix carefully not to smash the tomatoes too much and sprinkle with the fresh herbs of your choice. Serve immediately with crusty bread or sourdough baguette to soak up the juices. I, being Bulgarian, will usually add crumbled feta cheese, but the salad is perfect even without it. Eat in the garden or on the porch if you have one, with a cold fruity white wine, to keep the summer for a little bit longer. This one is the ultimate crowd-pleaser no matter whether you are serving it for dinner, during a grill party or from a plastic container at a picnic. I love potatoes in almost any form and several takes on potato salad are on my regular to-do list. The one here is my family’s favorite and I learned to make a lot of it as domestic disturbances often start over the leftovers. It’s hard to go wrong with this salad, but still there are few rules to be followed to get the best from even this simple combination of ingredients. Rule number one – always choose the smallest potatoes and make sure they are of a uniform size. It’ll cut the cooking time and will let them cook evenly. Rule number two – always cook them with the skin on. This helps preserve the vitamins which are right beneath the skin, and prevents the potatoes from soaking up too much water during cooking and getting mushy. Rule number three – be generous when salting the boiling water – there’s very little to be done to save an under-salted boiled potato. The water should taste like the sea to get it right. And rule number four – use real mayonnaise! With a salad of only a few ingredients, every one of them matters for the final result. So forget for a moment about the upcoming bikini season and go for the real thing – egg yolks, fat and all. I sometimes add crispy Granny Smith apples for an extra crunch and play with fresh herbs like flat Italian parsley, dill or cilantro (coriander) to add some color. There is no picture of the salad, because it was devoured too quickly during last Sunday’s end-of-the-academic-year grill party my husband threw for his fellow architecture grad students. It never met with the chicken and hamburgers it was supposed to accompany – I should have kept it in the kitchen until the last moment. Bring half a large pot of water to a boil. Add enough salt for it to taste like sea water, add the potatoes, skins on, and cook for 10-15 minutes or until a fork goes easily in when pierced. Drain and let cool enough to be able to hold when peeling. The salad will be tastier if made when the potatoes are still warm. In a small bowl place the onion, sprinkle it with salt and cover with cold water. Let stand 10 minutes, squish and drain – it will take some of the sharpness from the onion. In another bowl mix the mayo, mustard and lemon juice. Peel the potatoes and cut into big chunks, or thick rounds if using small ones. Taste for salt and add some if needed, but remember that the dressing will be pretty salty from the mustard. Grind the black pepper, add the mayo, onion and optional parsley, and carefully mix the salad to avoid crushing the potatoes too much. Taste and adjust the seasoning if needed.